IndoWebsite Review 2019: Is IndoWebsite a Good Hosting? With more than 10 years of experience, IndoWebsite makes sure that you’re covered with all that you need from a hosting service. It also provides 24/7 live chat support and plenty of payment options. IndoWebsite is one of Indonesia’s top hosting companies. It serves more than 40,000 active customers globally. Based in Bekasi, Indonesia, IndoWebsite was initially founded in 2005 as a small web design company, but then grew rapidly to establish its web hosting company under the name dplanet (which was later renamed IndoWebsite). Though available in Indonesian only, IndoWebsite has a sleek and clear website. IndoWebsite aims to provide quality hosting solutions at reasonable prices for a wide range of users, from private bloggers to large corporations. The company has two advanced data centers in Jakarta, Indonesia, as well as servers in the United States. It promises a minimum of 99.9% uptime and fast loading time. IndoWebsite offers a broad range of web hosting services such as shared hosting, cloud hosting, reseller hosting, VPS, and dedicated servers. It also provides website development solutions, domain registration, and SSL certificates. 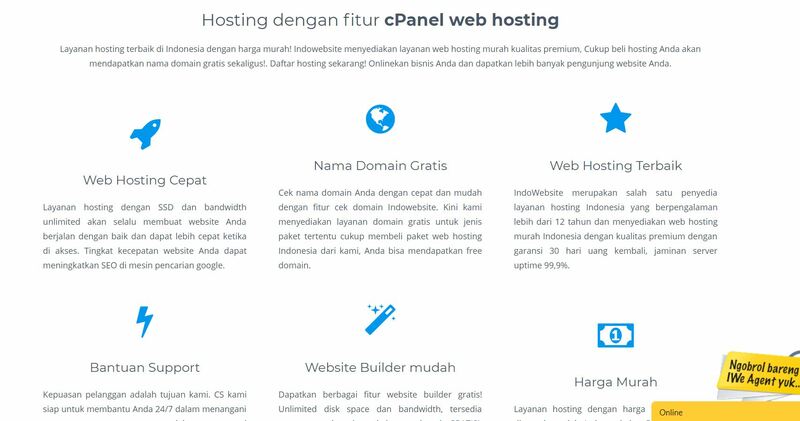 IndoWebsite makes it easy for beginners to create attractive websites, thanks to its feature-rich cPanel, Softaculous auto-installer, and website builder. Even if you don’t have a technical background, you can choose from a large selection of templates, add your content, and publish. Advanced users will appreciate technical features such as unlimited FTP accounts, unlimited MySQL databases, unlimited parked/add-on/subdomains, remote MySQL connections, cron jobs, and SSH access (in corporate plans). To make your website more secure and accessible, IndoWebsite also offers you the use of the Cloudflare CDN, which can be activated directly from the cPanel. The company also offers free website migration services as well as free daily and monthly backups to save you the manual effort. On the other hand, it only offers Linux-based hosting accounts, so Windows users will have to look elsewhere. IndoWebsite offers a selection of eight shared hosting packages for individuals and businesses. 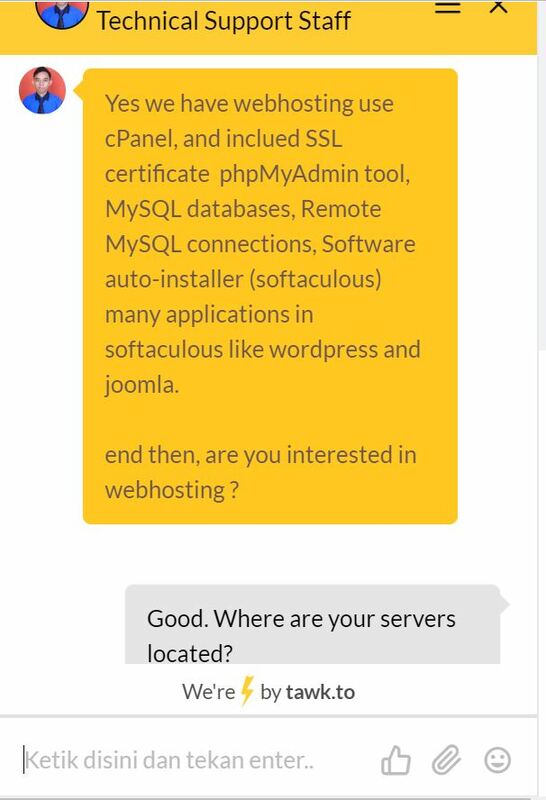 All plans include free domain names and SSL certificates as well as unlimited email accounts, FTP accounts, and MySQL databases. These plans differ mainly in pricing as well as disk storage. SSH access is also available within corporate shared hosting plans only. Despite the relatively low storage space offered, I personally find that IndoWebsite’s plans are a great bargain considering how many features you get. The company also offers a 30-day money-back guarantee and accepts a wide range of payment options including all major credit cards, bank transfer, PayPal, and many more. The downside is that there’s an additional fee if you want to restore a backup copy of your website, and the 30-day money back guarantee applies only to annual subscriptions. As for customer support, IndoWebsite has a highly responsive 24/7 live chat team that speaks good English. I asked all sorts of questions and the live chat agent was very helpful, knowledgeable, and equally patient. Don’t feel like chatting? There are other support channels such as contact forms, email, and an extensive knowledge base. In spite of minor drawbacks such as low storage space and an extra charge for backup restores, IndoWebsite is a great choice for a variety of users, individuals and businesses alike. It has a solid infrastructure and offers high-quality products at a low cost. Wondering how IndoWebsite stacks up against other Web Hosting companies? Enter any other Web Hosting company and we will give you a side-by-side comparison.